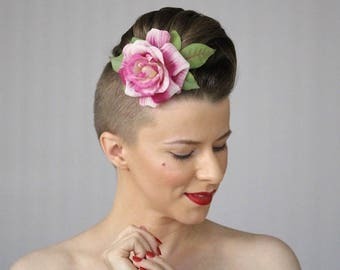 Rose Fascinator, Flower Hair Clip, 1930s Headpiece, Vintage Hair Accessories Dark Pink Red - "A Wink & A Kiss"
"A Wink & A Kiss"
This heart-melting rose fascinator is made from actual reclaimed vintage millinery supply. 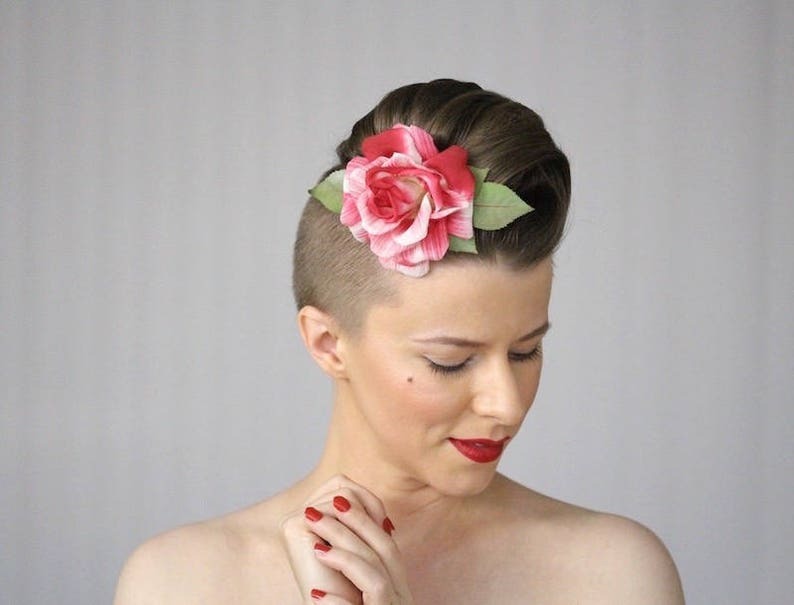 A full bloom silk rose, hand painted with the most beautiful shades of dark pink to lipstick red on white, sits atop magenta veined green leaves. Dreamily, the original tag on this notes the color as "Romance". NOTE: You can choose between an attachment style that has the flower designed to face forward or that has the flower laying flat. 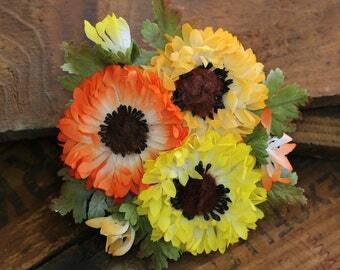 You can choose one flower clip or two at a discount (one photo shows how I styled two together). On the forward facing option: there are two slits in on the attachment where you can slide the clip out and turn it the other way. 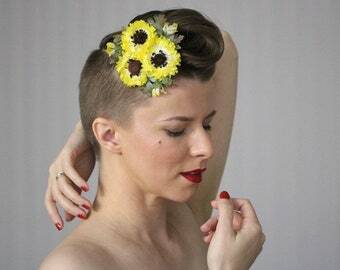 This allows you to wear the rose facing forward on either side of your face. On the flat laying option: you can use the attachment of your choice. Just slip the included alligator clip through the back to use. 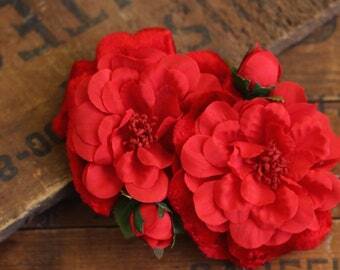 Or grab a clip or skinny headband of your choice from home and slip that through instead! 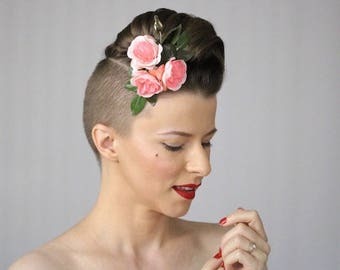 Dusty Blue Floral Fascinator, 1940s Flower Hair Clip for Women, Vintage Headpiece, Powder Blue Headband - "A Cloud's Kiss"
Pink Rose Hair Clip, Vintage Flower Hair Accessory, 1930s Headpiece, Floral Fascinator, 1940s Velvet Silk Rose - "Paris in the Springtime"
Pink Rose Clip for Women, 1930s Hair Flower, Vintage Rose Fascinator, 1940s Floral Headpiece - "Knock Me a Kiss"
Pink Floral Headpiece, Vintage Hair Flowers, Pink Roses for Hair, Valentines Fascinator, Spring Flower Hair Clip 1950s - "Bathed in Roses"
Navy Flower Hair Clip, Dark Blue Fascinator, Floral Headpiece, Vintage Rose Hair Accessory, 1950s Hair Piece, Camellia - "Moonlight Bloom"
Really stunning. I appreciate the wonderful service and attention to detail. 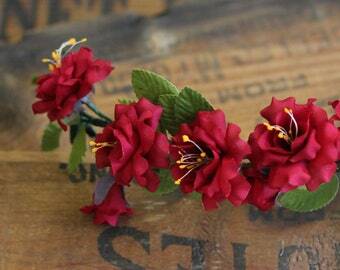 I love it and can't wait to order another! 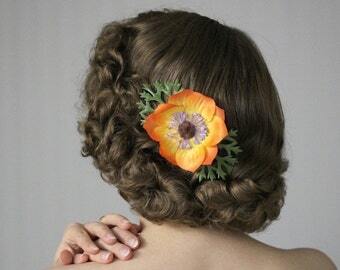 Gorgeous hair flower, beautifully made. Thank you Chatterblossom! 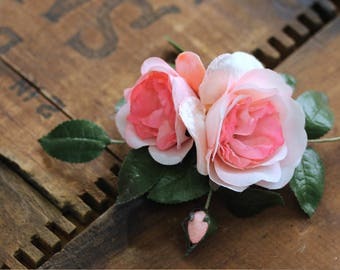 Roses For Hair, Pink Rose Fascinator, Flower Clip for Women, 1930s Hair Accessory, 1940s Floral Headpiece - "Paris in the Springtime"
Flower Hair Clip, Red Clip for Women, Rose Hair Accessory, Camellia Hair Piece, Small Floral Clip for Hair, Vintage 1940s - "Just One Kiss"
Large Pink Fascinator, Flower Hair Clip, 1950s Headpiece, Derby Hair Accessory, Vintage Floral Clip, Pink Flower White - "Bubblegum Punch"
Pink Fascinator Flower Hair Clip, 1950s Floral Headpiece Vintage Headband Hair Accessory, Pinup Hair Piece Retro - "Bubblegum Sunrise"